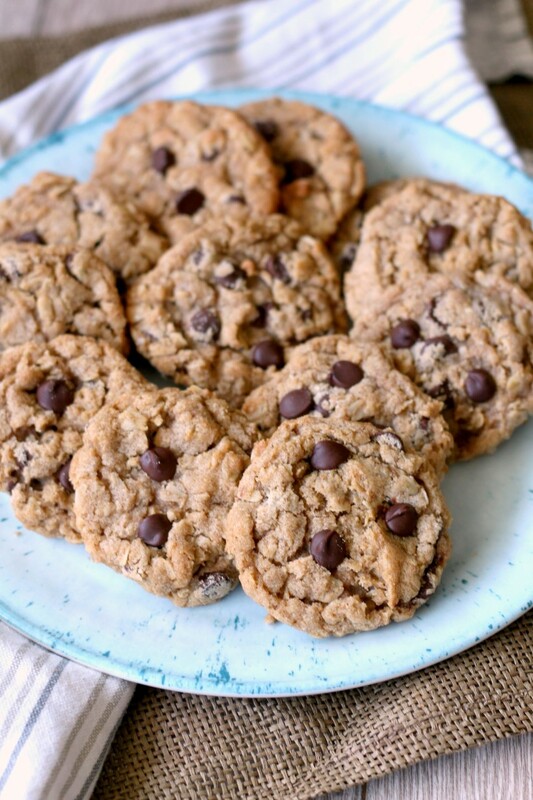 I have about 5 other brown butter baking recipes on my site so you can tell I’m a fan. Brown butter and peach is one of my favorite flavor combinations. I have brown butter peach cupcakes, brown butter peach sweet rolls and even a brown butter peach milkshake. I used brown butter in these cranberry apple crumb bars. 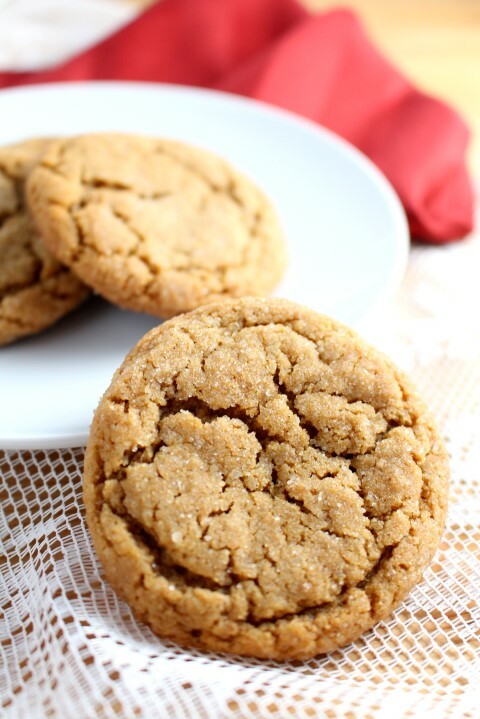 And pumpkin is another favorite flavor to pair with brown butter, hence pumpkin cookies with brown butter glaze. First, you have to brown the butter. If that intimidates you, check out this post for detailed instructions. It’s not hard, just keep an eye on it. It can go from brown to burnt in seconds. Then comes the hard part, letting it come back to room temperature and solidify. Once, the brown butter is solid again, the rest of the cookie making process is standard. Cream the butter with the sugar, beat in eggs and vanilla. Then stir in the flour, oats and other dry ingredients. And don’t forget the chocolate chips. 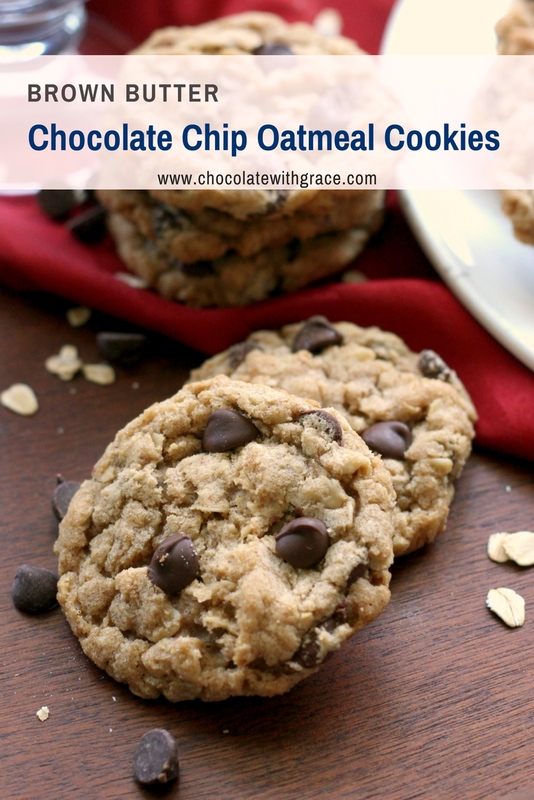 They are part of what makes these the best brown butter oatmeal cookies. You won’t find any raisins here. Roll the dough in balls and chill for just about 30 minutes before baking. If the cookies spread too much. Chill them a bit longer. If they don’t spread, warm the dough up a bit. 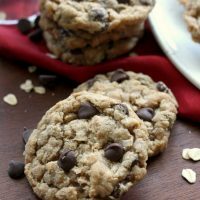 This recipe makes a thick, chewy oatmeal cookie that tastes amazing thanks to browned butter and chocolate chips. Brown the butter and let it cool back to room temperature and solidify. In a large bowl, cream together the brown butter, brown sugar, and granulated sugar. Beat in eggs and vanilla. In a separate bowl, whisk together the flour. cinnamon, salt and baking soda. Add the dry ingredients to the wet and stir together. 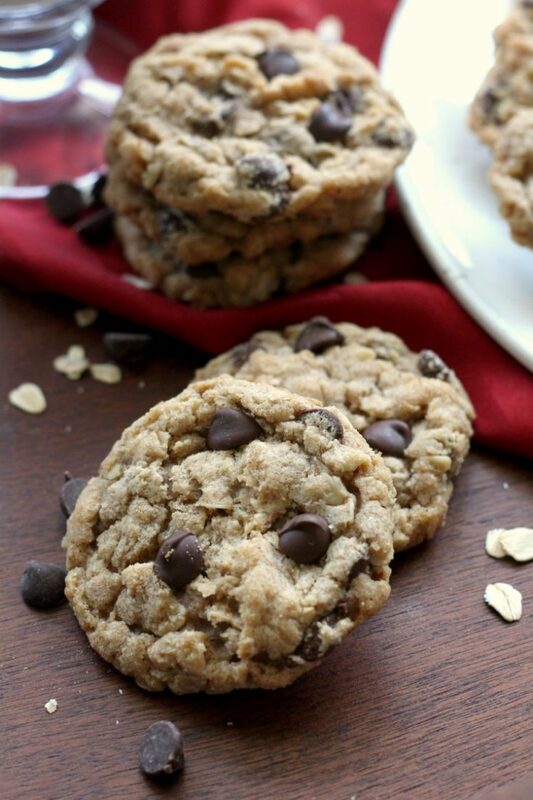 Stir in rolled oats and chocolate chips. Roll the dough into 1 inch balls and chill for 30 minutes. Preheat oven to 350 F. Bake for 9-11 minutes or until just browned around the edges. Remove from oven and let cool on the cookie sheet for several minutes before removed to wire rack to cool completely. 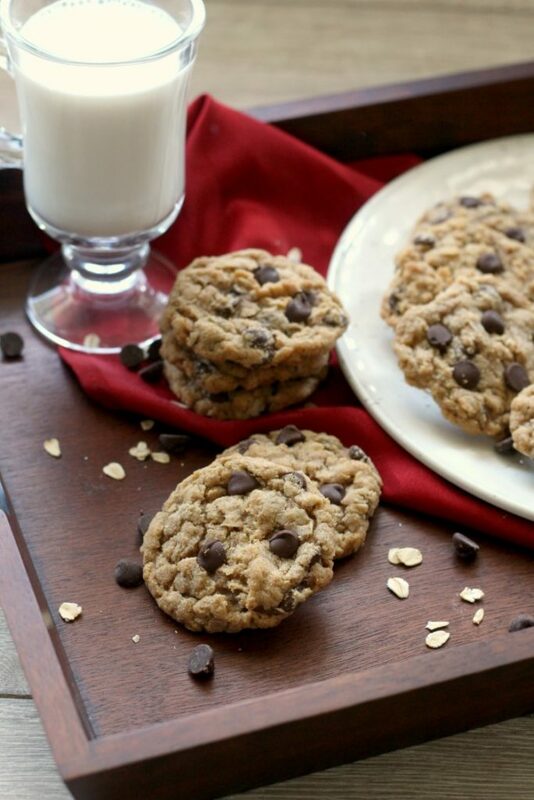 Here are some of the best cookie recipes on my site. I need this cookie in my life! Thanks for tips on browning the butter. I have a weakness for brown butter!!! These cookies look irrestible! 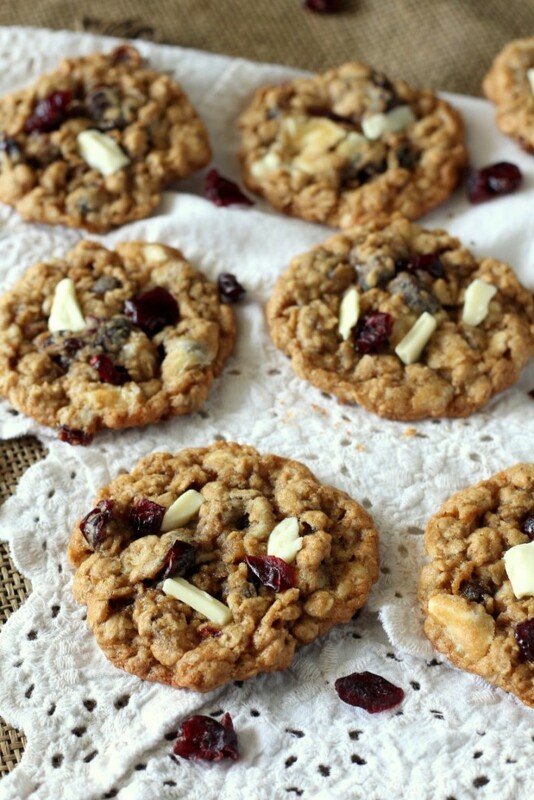 These are the best cookies ever – the browned butter takes them over the top! Mmm. Love browned butter! These look delightful.